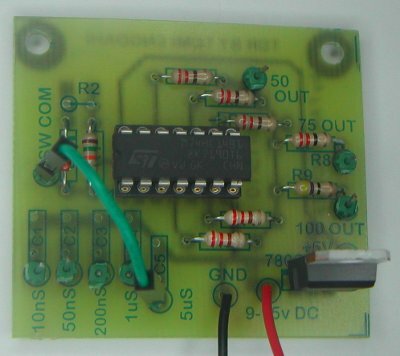 My Time Domain Reflectometer (TDR) circuit has been available as kit made by Far Circuits. 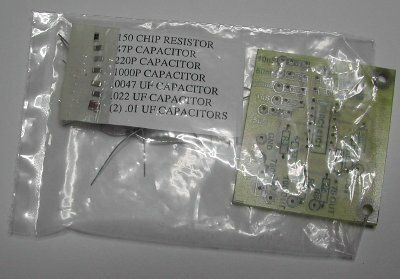 The kit consists only of circuit board and components needed to build the circuit in a small plastic bag (you need to download the building instructions). The original circuit design is from my web page and Far Circuits added 5V regulator and designed the circuit board. I have written some information about the TDR kit earlier, but now you have more. I just finished building my own kit sample some days ago. Around half of the components on the kit are SMD components and half of the components are traditional through-hole soldered components. I was pretty easy to build, no problems there. I used lead free solder to build the circuit even though it might not be optimal solder if some components contains lead. I first soldered the SMD components to clean circuit board using pinbypin method. Then I assembled the through hole components to their places and solder them. The kit worked well but with some reduced performance compared to my original design. The original circuit design used pretty high speed 74AC14 IC, but this kit I received used a slower speed 74HC14 IC. That was the actual IC that was in component bag instead of 74AC14 as listed on the component list. Things seen on the pictures not included on the original kit: IC socket, pins to connect wire to, jumper wire connected between two pins to select the pulse length and the wired feeding power to the circuit. NOTE: The first kit versions were shipped with 74HC14 IC. According to Farcircuits the newer kit versions are shipped with 74AC14 IC. This is great info. I want to implement the TDR circuit in a cable tester for one of our laboratories at the University of Stellenbosch Engineering Department. I just have one question. Will the TDR also work with cables that have a DN-15 connector? Would very much appreciate a reply! I needed to write you one bit of remark to be able to give many thanks over again for your personal beautiful pointers you have documented in this article. It’s really pretty generous of you giving publicly all a lot of folks would have advertised as an e book in making some dough for their own end, specifically given that you could have tried it in the event you decided. The solutions in addition worked like a great way to know that some people have a similar passion just as my personal own to know the truth good deal more in respect of this problem. I’m certain there are thousands of more pleasant situations in the future for individuals who scan your blog post. match the impedance. Before you can match it, you have to measure it, though, typically using time domain reflectometry (TDR). The problem is that the impedance of a device while powered (hot) differs significantly from its level in the off state. In response, many high-speed digital standards call for impedance analysis while the device under test (DUT) is hot. Hot TDR basically involves launching a step voltage into the system and monitoring the reflections generated by impedance mismatches. In the past, that’s been performed using oscilloscopes, but we’ve seen increasing interest in the use of vector network analyzers perform the task in the frequency domain. Joining the PicoScope 9300 series of PC-based sampling oscilloscopes from Pico Technology are two 20-GHz models that perform time-domain reflectometry (TDR) and time-domain transmission (TDT) measurements on high-frequency cables, PCBs, backplanes, and interconnections. Each instrument’s built-in differential edge generator has a rise time of 65 ps at up to 6 V for the PicoScope 9311 and 40 ps at over 250 mV for the PicoScope 9312 (via plug-in pulse heads), providing a typical distance-to-fault resolution down to 10 mm. can be used for precompliance testing, fault-finding, and margin testing on serial data signals, such as 10-Gb Ethernet, SONET/SDH STM64, 10X Fibre Channel, InfiniBand, and PCI Express. The PicoScope 9311 and PicoScope 9312 cost $18,995 and $22,395, respectively. Propagation of electrical power along a transmission line occurs in the form of transverse electromagnetic (TEM) waves. A TEM wave propagates primarily in the nonconductor (dielectric) that separates the two conductors of a transmission line. Electromagnetic waves that travel along a transmission line from the source toward the load is called incident waves. Electromagnetic waves that travel along a transmission line from the load back toward the source is called reflected waves. Reflected power is the portion of the incident power that is not absorbed by the load. When the load is is not equal to the characteristic impedance of the line, some of the incident power is reflected back toward the source. How can I order the TDR kit? If my cable length 8.5 KM your tdr kit can do it? I am not sure would the circuit be sufficient for 8.5 km distance for sure. The circuit design works well up to several kilometers (Longest distances I have tested have been 1-2 kilometers). The signal should travel longer distances well, but the question is the echo that come back very much attenuated from this long distance still useable (depends on cable losses and what is the lowest signal level you can detect without lost in the background noise). A Time Domain Reflectometer (TDR) is possibly one of the most important tools in a cable tech’s truck if it’s understood and correctly used. It is used to not only find the location of a fault within a cable but it is also used to identify degrading cable conditions before specific problems develop. Proactive maintenance is invaluable, particularly in Triple Play. The ability of the trace, when properly programmed and interpreted, to indicate where water starts and stops in an air-core cable. technology, which has been around for several decades. Catching a fault before it significantly impairs system performance by definition requires testing outside of the normal system bandwidth. Because TDRs such as the CT100 provide measurements that are orders-of-magnitude faster and more precise that FDR DTF measurements, TDRs usually provide the quickest and most robust cable and connector fault detection and localization in typical microwave/RF and digital systems. Time-domain reflectometry (TDR) is a very simple concept. A voltage pulse or step is applied to the end of a cable, and the reflections are measured and analyzed. As with most simple concepts, the detailed implementation determines how well practice conforms to theory. To determine details of faults within a 1-m length of cable requires a sampling rate significantly faster than 100 MS/s—the rate corresponding to a 10-ns period. For this reason, many TDRs are based on sampling scope techniques that use equivalent time sampling (ETS). Interleaved random sampling is a faster form of ETS found in some high-bandwidth DSOs. In these techniques, a repetitive signal is required. All types of ETS reconstruct a representative waveform from samples taken on successive repetitions of the signal. Because S parameters are defined as ratios of incident and reflected waves, they can be determined by a TDR. Alternatively, you could use a vector network analyzer (VNA). There is some truth to the observation that engineers accustomed to working with scopes in the time domain prefer TDRs while RF and microwave engineers are more comfortable with VNAs. However, there are fundamental instrument differences as well as user preferences. These aare inn fact great ideqs in regarding blogging. You have touched some good things here. Anyy way keep up wrinting. Some of the most versatile and intuitive tools in a signal integrity engineer’s arsenal are TDR (time domain reflectometry) and TDT (time domain transmission). Time domain analysis gives an insight into how electronic signals propagate through different dielectric media through a conductor whose geometric dimensions also influence these responses. As a signal propagates through PCB vias, connectors, interfaces, ground-plane interruptions, etc., TDR and TDT are commonly used to identify and quantify these environments. Let’s look at how one can associate different environments to TDR responses. It must be noted that, when it comes to interpreting complex TDR responses, there is no substitute for experience. With that said, fundamental TDR responses to simple environments provide the building blocks for interpreting complex TDR responses. From these classic TDR responses, you can begin to decipher a complex TDR response, a section at a time. You should know the general layout of the structure being measured to identify landmarks such as connector interfaces. Connect a long length of your cable under test to the other side of the Tee connector. Leave the far end of the cable open. What happens is the pulse launched into the cable whips by the scope and triggers the sweep. That pulse continues to the far end of the cable where it encounters the open end. In most cables, the pulse travels at a velocity factor of about 66% of the speed of light in a vacuum (300 meters/µs), resulting in a cable speed of roughly 200 m/µs (check the cable data for a more precise number). If you do not know the cable length, you now know how to measure it. Play with the pulse period and time base until you can see both the launched pulse and the reflected pulse. The time between them is the round trip time of 0.1 m/ns, or 10ns per metre of cable length. Impedance measurement is simply a matter of placing a small trimpot of about 200Ω across the far end of the cable and adjusting it to minimize the amplitude of the reflected pulse, which now gets fully absorbed by the trimpot load (less a small reflection from the trimpot stray capacitance). If the trimpot is set higher than the cable impedance, the reflected pulse is the same polarity as launched, but if the trimpot is below the cable impedance, the reflection polarity is opposite. Take the trimpot off the cable, and without disturbing the setting, measure it with an ohmmeter. This is the cable characteristic impedance. In a previous post I discussed an impedance measurement technique for coaxial cable. The same trick can be used for twisted pair, with the addition of a small pulse or RF transformer. Generally for twisted pair, the impedance is around 100 to 120 ohms, so you will want a turns ratio of 1.4:1 to 1.5:1, with the lower turns count towards the scope, but it’s not critical; 1:1 will do if that’s all you have handy. The transformer is essential to convert the unbalanced BNC and coaxial into a balanced signal where both conductors are differential to each other and both see the same capacitance to ground. Attempting to measure without the transformer will give erroneous results. Well, I once wondered what the impedance of AWG 30 Kynar insulated wire (the standard wire wrap stuff) is when twisted into a pair with an electric drill. The stuff measured 102 ohms with the trimpot test. Now, you know how to find a defective installed cable. Terminate the far end in a resistor equal to the characteristic impedance: You should not see much of a reflection. If you do there is a cable fault such as a kink or broken conductor at the location you calculate by the measured round-trip delay. slowly merge the traces together until the dimmer space between them combines to the same brightness as the center portions of each trace. Now remove the input noise signal and measure the apparent voltage on the graticule between the two quiet traces. This reading should correspond to the noise amplitude in the bandwidth of the scope. Offering a choice of five output impedances, the TDR2010 dual-channel time-domain reflectometer (TDR) from Megger locates faults on all metallic cables, including twisted-pair wires and coaxial cables. An auto-setup function determines the impedance of the cable under test, sets the unit accordingly, and selects the optimum gain and pulse width. Users can override the auto function to fine tune the test and identify hard to determine faults. The TDR2010 furnishes 25-Ω, 50-Ω, 75-Ω, 100-Ω, and 125-Ω impedances. Velocity factor can be set between 0.20 and 0.99 to meet any cable test requirement. The instrument has a minimum resolution of 0.3 ft (0.1 m) and a maximum range of 60,000 ft (20 km), depending on velocity factor and cable type. This great old video (embedded below the break) from Tektronix in the mid-60s covers a topic that seems to confuse folks more than it should — transmission lines. 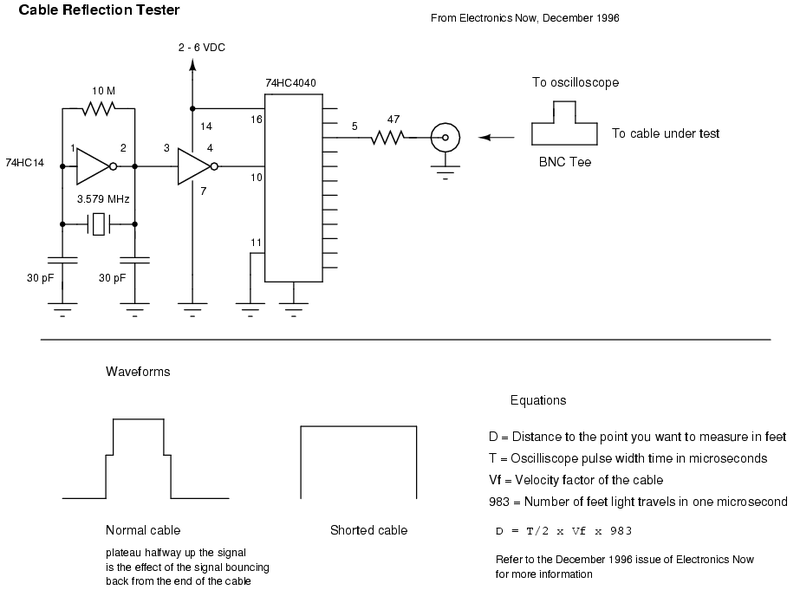 Here is a schematic for a homebrew cable reflection tester from the December 1996 issue of Electronics Now. It’s very useful for checking coax cable runs for shorts or even impedance mismatches. It works by sending a pulse down the cable, then checking the return signal on an oscilloscope. You can then determine the distance to a short or impedance mismatch using simple distance = time x speed equations. Be sure to divide your time by 2, and take in account your cable’s velocity factor. Testing cable assemblies for signal integrity usually requires connecting the cable assembly under test to a TDR (time-domain reflectometer) or to a VNA (vector-network analyzer) through some kind of test fixture. That process is well known and documented, but how do you characterize the bare cable before it’s cut and attached to connectors? To properly characterize a 50 Ω cable, you need to maintain its nominal impedance. Then, you have to de-embed any added connections to measure the bulk-cable’s properties. Given that every cable needs at least two conductors, the bulk cable’s nominal impedance becomes 100 Ω. Harting engineers found that simply soldering, taping, and shielding the bulk cable to a traditional semi-rigid coax was not only impractical, but it resulted in an impedance mismatch. The fixture that Harting engineers developed (Figure 1) uses an impedance-matched PCB to connect the bulk cable to connectors that then attach to the test equipment. Because soldering the bulk cable to the PCB isn’t practical, Harting engineers designed a compression mechanism to press the bare wire to the PCB and it prevent the cable from moving during a test. The fixture applies pressure to the stripped ends of the bulk cable, compressing the bare wire to the PCB. 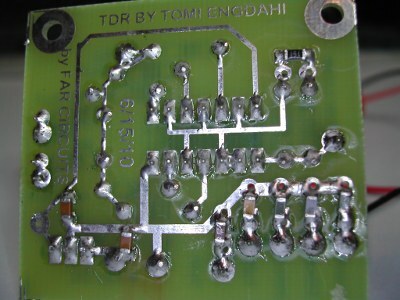 help you to understand how an actual TDR works. Learn to use the CT100 TDR Cable Tester to measure Distance to Fault (DTF). Includes discussion of setting velocity of propagation (VoP, Vp), finding the fault and positioning the instrument cursors to best measure the distance to the cable fault on the TDR waveform and between faults using both cursors. Trying the TDR ( Time Domain Reflectometer ) with different oscilloscopes. First, the old Tektronix 547 shows it’s stuff, then the TDS220 oscilloscope, soon after. Any signal-integrity engineer will tell you that analyzing closed eye diagrams has never been easy. A transmission channel’s frequency response (or lack of bandwidth) causes inter-symbol interference (ISI), the primary eye-closing culprit. While I’ve written about closed eye analysis techniques before, this time we’ll measure the ISI left over after equalization, the so-called residual ISI. In the process, we’ll see the simple guts of decision feedback equalization (DFE). The pulse response is gaining popularity in technology standards that define high-speed serial buses. You can produce a pulse with a pattern generator by transmitting a long string of zeros, a one, and then another long string of zeros, that is, a pulse is a non-return-to zero (NRZ) bit and the pulse response is the same as the SBR (single bit response). Like the impulse response, the pulse response includes everything there is to know about the circuit, the impedances of every trace, connector, cable, pin, ball, and so on. It’s all built in, both magnitude and phase. Visualization of the voltages and currents for electrical signals along a transmission line. Chip Tips #8: Transmission lines and reflections, tested. This video shows how to measure the value of unknown capacitors and inductors using your oscilloscope and a simple pulse generator. There are many ways to do this, but this video focuses on just two basic techniques. 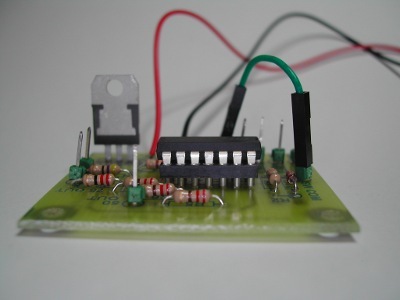 The techniques are very simple, and are a good example of basic principles of RC and LC circuits. High-speed signals such as microwave carriers and digital data streams lose fidelity as they travel. Losses from PCB traces, connectors, and cables need measurements on those losses, the reult of impedance. For $3500, you can use the J2151A PerfectPulse to send a signal with known rise times through a transmission path. From those pulses, you can characterize the path. Instruments such as the Analog Arts ST985 (www.analogarts.com), based on the TDR and wave transmission concept, characterize the length, impedance, and other characteristics of a cable. When a signal travels through a cable, it is undisturbed until it encounters an impedance change, and if it encounters an open circuit, all of the wave reflects back to the source. The characteristic impedance of the cable and the load impedance, determine what happens to the signal at the load. A higher load impedance reflects a part of the signal back to the source. There is no reflection when the load impedance is smaller than the impedance of the cable. However, smaller loads cause signal loss. An equal load impedance prevents signal reflection while delivering maximum amount of power to the load. An impedance mismatch can happen whenever the signal medium changes. For example, when the source is connected to the cable or at the load. These mismatches cause reflection and signal loss. In general, the source output impedance, cable characteristic impedance, and load impedance must be made equal for optimal performance. Impedance matching maximizes the power transfer to the load and eliminates signal reflection. A perfect impedance matching transfers half of the source power to the load. Showing how a square wave signal is distorted by reflections from the unterminated end of a cable. Also shows proper terminating resistance and its effects. This video touches briefly on transmission line and reflection theory, but is definitely not intended to dive deep into these topics.